A little less than twenty years ago, I paced nervously in the upper halls of an old Puertorican hospital, praying like most young fathers that God was watching and would see another one of his precious daughters safely into this precarious existence. My Father was expected to arrive from Utah, but hadn't yet, and having looked so forward to his always unfailing strength while awaiting my fourth child, I began to wallow in worry of a cornucopia of the dreaded "What If"s". Two years earlier, Kent had blessed our lives, but his arrival and early days of life had passed with fear and trembling accompanied by much prayer and fasting in hopes of him even being able to survive the first week, so you might imagine the worries my anticipation of another delivery would con jure up. I was a mess, and when my father finally stepped from the elevator to join me I in my wait, words cannot express the lift his presence alone supplied. I love my dad, ...Mom too, but in that moment, something about his strong embrace and sacred mantle of fatherhood, which I may add, he has always carried with honor and dignity, was just the thing to set my convulsing heart to rest. Together we endured the next few tenuous minutes until Diana was wheeled from the delivery room in a small cart on her way to the nursery. She was a miracle baby, sent to us on the heels of a heartbreaking miscarriage only a few weeks before her conception, and to see her alive and well was nothing short of perfect. 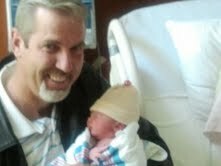 Today, I again stood in the hallway outside the delivery room waiting to hear the first cries of a baby, but this time it was with my lovely Marianne beside me, as we hoped for the blessings of heaven to attend my once infant daughter of twenty years ago as she delivered little Jordyn, our first grand baby into the world. Like exuberant school kids, we strained our ears for sounds of progress from within the closed doors, and nearly leaped out of our pants at our grand daughter's robust cry. Sealing the moment with a tender kiss, Marianne and I silently reflected back on the precious first moments with our own wonderful children as they each opened their mouths filling the air with the announcement of their arrival. What a glorious gift God gives us, to have this blessed opportunity of family. I thank him from the bottom of my heart, as I'm sure my sweet Marianne does. Welcome to our sweet Jordyn Kay Johnson, ...to you goes our greatest hopes, sweetest dreams, and most tender expressions of love. Quinn, that's lovely! I have tears in my eyes. So very well expressed!